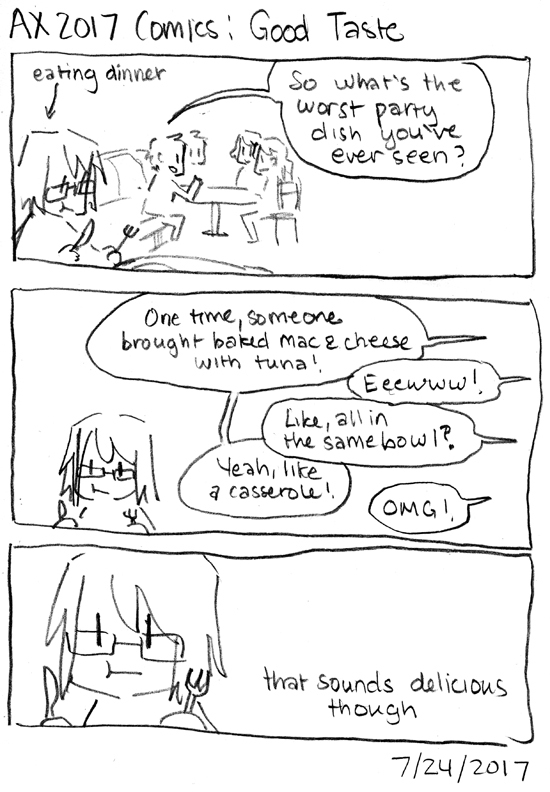 Overheard while eating at a nice restaurant after Anime Expo was over… Mac + Cheese + Tuna was one of my staple meals in college, and baking that combination sounds like an amazing idea?! But I haven’t eaten it in a while… maybe my tastes have changed? By the way, that’s the last of my Anime Expo comics! Filler comics will continue for a while (real life has been nuts) but hopefully I can make good progress on Herogirl soon. I hope you’re enjoying these small comic strips in the meantime! Sounds pretty good to me. I’m not a fan of tuna, but it’d be better to have that in baked mac and cheese than sliced hot dogs, and I’ve had that before. It might depend on the type of cheese, macaroni usually goes with cheddar, but I wouldn’t want to combine that with fish. Maybe mozzarella. Breadcrumbs, or crumbled soda crackers, are a good addition to baked mac and cheese, too; and would help keep the other tastes from being too overpowering, whatever they are. Breadcrumbs sound like they would be an amazing addition to this! I looove a crunchy crust to a baked casserole! We’ve got two different macaroni casseroles in my family — one with tuna, cream of mushroom, and american cheese, and the other with cheddar, brown mustard, and hot dogs. Both liberally sprinkled with french-fried onions, of course. Maybe I should try combining the two sometime. Ooooh, I’d eat a combo of that! Excuse me while I steal your family’s recipes, those both sound delicious! Mix the tuna, cream of mushroom, and about half a can of onions together. Cook the pasta (aim to get it a little underdone), then mix it in with the tuna stuff in a baking dish. Add a layer each of american cheese and onions on top, then cover it with foil and bake the thing at 350 degrees for about 30 minutes. Take the foil off for the last 5 minutes or so so the onions on top get crispy. Goes great with a green vegetable (we usually use peas) and black pepper. Oh mannnn thanks for the recipe! Ooh, one of my favorites! My sister brought home the recipe from her “home economics” class in 6th grade back int the 1960s and we’ve both been making it ever since. It starts with a white sauce made with 2 T Flour stirred into 2 T melted butter to which you VERY slowly add 2 c milk, when the sauce is hot and bubbly, stir in 1/2 lb of grated sharp cheddar cheese. Cook a pound of small elbow macaroni (or other pasta,) and while it’s cooking, open and flake a can of tuna fish into an ungreased glass casserole dish. Mix in 2 T lemon juice, then the cooked macaroni, and carefully stir in the cheese sauce. Bake at 350 F for 45 minutes. Makes 6 to 8 servings. I used to add salt to the recipe, but you use less and taste it more if you add the salt to the food after it’s on your plate. I don’t usually like sharp cheddar cheese, but mild or medium cheddar tasted so bland in this recipe not even the dog wanted to eat it! Oooh I’ll have to try this one too, thank you!